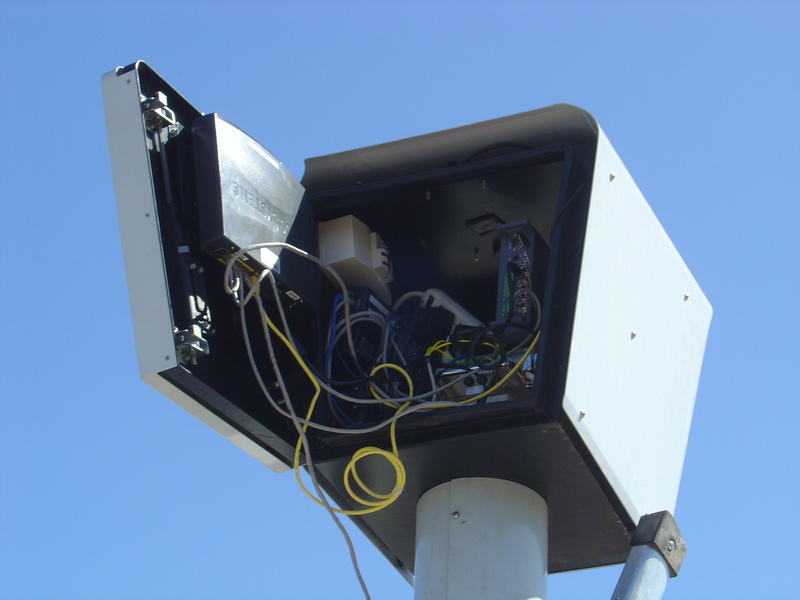 Ever Wonder What’s in a Red Light Camera Box? Ever wonder what’s in a Redflex Red Light Camera box? 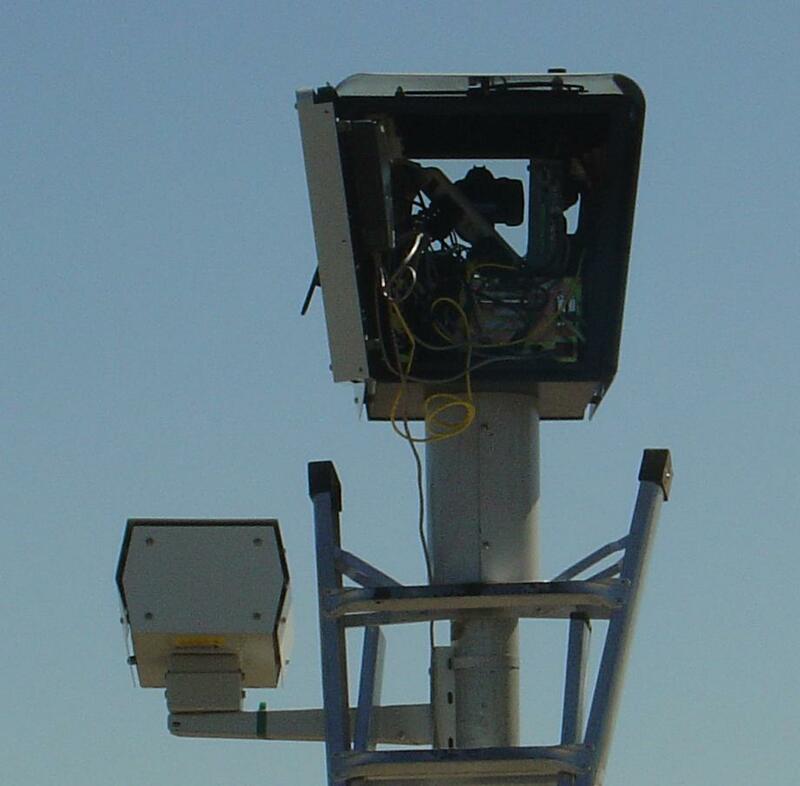 We recently caught a glimpse while a Redflex technician was servicing the unit at 83rd Ave & Union Hills. All of the equipment is jumbled and laying haphazardly inside of the unit. Click on the pictures for a closer view. Of course, since Reflex is above the law, they have no problem with breaking the city ordinances in order to save a few steps. 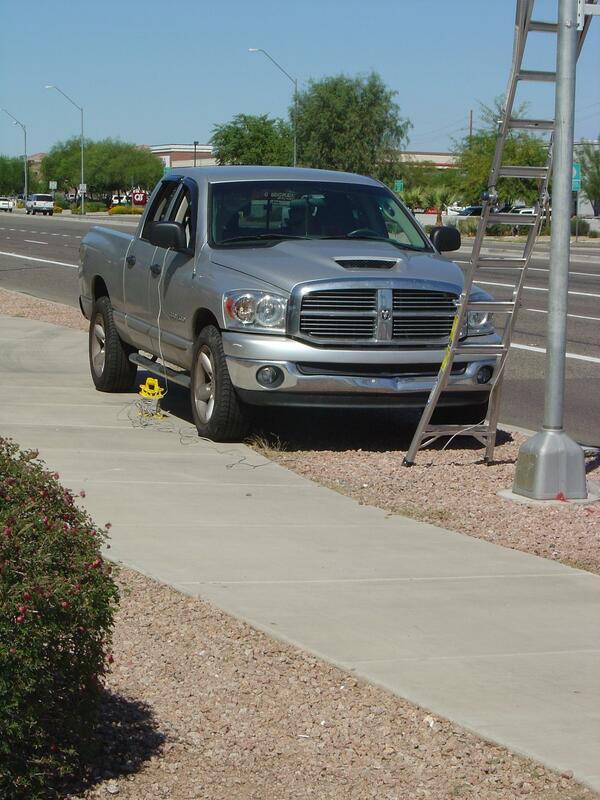 In Peoria, it’s illegal to park in the public right away and to obstruct a sidewalk. Nevermind the fact that there’s a Circle K parking lot he could have used just a few yards to the West, but that would have required the technician to have to walk a few more steps. 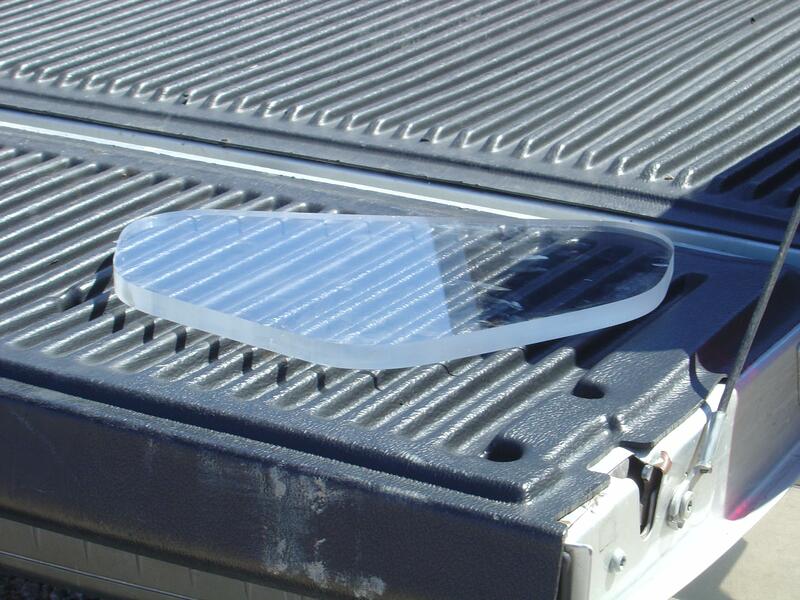 And if you ever wondered how thick the glass is, here’s your answer. After the technician finished servicing the unit, you’d expect that he’d be required to test the system to make sure it’s all working correctly, but you’d be wrong. Equipment accuracy and functionality has never been important in the quest for profits. The technician finished servicing a piece of equipment, placed it back inside of the unit, and sped away without performing any apparent testing on the system. This entry was posted on Tuesday, December 15th, 2009 at 11:03 pm and is filed under CameraFraud.com, Redflex. You can follow any responses to this entry through the RSS 2.0 feed. You can leave a response, or trackback from your own site. 22 Responses to Ever Wonder What’s in a Red Light Camera Box? I know this is just a personal observation, but I think the calibration on these cameras continues to get worse by the day. I was flashed going 5 MPH UNDER the speed limit twice last Tuesday and was ticketed once for it. This system is a disgrace. As long as we have the photo evidence of the parking violation, why not turn it in and demand prosecution? If the city can collect fifteen or twenty dollars for a parking violation, that’s still revenue right? The city can’t just decide arbitrarily to not ticket someone working for them can they? If they can, the next step will be to forgive city employees for all photo radar tickets. Does anyone have some napalm? I think it would make a fabulous holiday gift to Redflex.. The violation line is at the Continuation of the curb on the roadway. In arizona, you are not officially in an intersection until you have crossed the line which would be a continuation of the curb. The violation line is painted on the roadway to show the actual location of the continuation of the curb. In Arizona, it doesn’t matter what line you go by, as long as you don’t cross the continuation of the curb while the light is red. Surely with that thick piece of lexan on the front of the box that these things bake under the summer sun. It is a wonder that the rest of the electronics haven’t melted down by the end of summer…. Anyone care to guess if the temperature inside the scammera box goes above 40°C (104°F) during the summer? The Nikon D3 DSLR camera (at $5k a copy) has an operating environment Tmax of 32°-104°F according to the user manual (page 432). I have not looked at every Nikon manual for their current crop of cameras but based on the ones I have read that 32°-104° would be fairly typical for a digital camera, even a pro quality unit. I have considerable professional experience with measuring temperatures inside of enclosed areas that are sitting the AZ sun and I’d bet the inside of the scammera box, even if it’s insulated, is rising to at least 60C°. Cooking the electronics every day beyond it’s Tmax spec is bound to lead to errors in function. Chuck, this is one of the defenses the I would advise using in court, especially if it was particularly hot or cold when the picture was taken. Redflex does not record the temperature and cannot guarantee performance of their equipment if the equipment is not rated at those temperatures. Although one thing is that the camera either works or it doesn’t, and you either have a photo or you don’t. So I don’t think you’ll be successful with arguing that the camera wasn’t working right if it took a picture. But the sensors and the computer system, that’s quite another story, and some of those sensors are buried in asphalt. So my plan (of many) should I ever get a ticket and go to court, is to ask Redflex a) what temperature tolerance EACH component is rated at and b) what temperature was it INSIDE OF THE UNIT when the picture was taken. Then you ask if there were any witnesses at the exact time of the violation monitoring the equipment to make sure it was working properly, and when they answer ‘no,’ you ask the judge to dismiss the ticket because they have no witnesses and because they don’t know if their equipment is certified to work in the environment is was placed in (or it was working at a temperature that it’s not designed to work at). Is there a heat tolerance for the sensors in the road? There’s a heat tolerance for ALL electronics. It’s likely that the sensors in the road are essentially wires that measure inductance. These wouldn’t need calibration because when a motorcycle or a car passes over the sensor, the change in inductance will be great enough to trigger the sensors in the box they’re connected to. It would be wiser to argue about temperatures inside the head of their equipment if you go to fight redflex in court. Judging by the silhouette; I think the camera in there is a Cannon EOS. Not sure of the exact model though. The safety glass looks quite thick. Anyone ever try using a paintball ‘bazooka’ to optically disable the errant Scam-Erra? The above message is NOT a suggestion. The above message is simply hypothetical. The above message is for entertainment purposes only. The above message is NOT meant to promote vandalism. I hope I covered my a** on that one. I could totally see someone knocking off the guy who goes out and downloads the red light offenders information, and then takes the computer in the truck. I hope Red-flex subcontractors get paid real well or provide there employees with life insurance. Just send REDFLEX in Australia a nice surprise in the mail from us good old Americans…..Boom…..
Have you ever thought of adding additional videos to your blog to keep the viewers more engaged? I just read through the whole article and it was quite nice but since I learn visually, I find videos to be more helpful. I dig what you guys are always coming up with. Keep up the good work. I will revisit your website daily for some of the latest post.